Fibroids Almost every woman that menstruate has at least one small fibroid in her womb, yet most never even know they are there. If fibroids are indeed so common why are they so feared? Why are people sad when they know they have it? This is because they are misunderstood. They are benign tumors (or smooth muscle masses) that grow inside the walls of the uterus common to everyone that menstruate. The most common type of tumor found in the body, no one knows for sure why fibroids so commonly grow in the uterus. One theory is the fact that the uterus is an organ whose purpose is to grow a fetus, making it the perfect place for any mass of cells to reproduce. Fibroids can be so small they cannot even be felt during an internal exam or they can be so large that they seem to make the patients belly protrude. 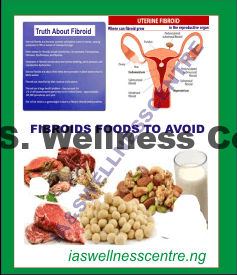 NIGERIA FOODS THAT INCREASE FIBROIDS TUMOR IN THE WOMB. Here are the list of foods women with fibroids are not aware of and majority like eating them, which in turn nourish and increase the fibroids in their womb. If you can’t do without them totally, then reduce intake. SPEED REMEDY TO DESTROY, SHRINK AND DISSOLVE FIBROIDS. Research into the natural world has discovered natural medicines that dissolve fibroids without surgery. We are so proud and confident about our Fibroids solution kit. Also, We have treated hundreds of people successfully with it and many are pregnant after treatment. Finally, We are backed with facts and proves. This kit has been tested and confirmed to dissolves fibroids inside or outside the womb. This entry was posted in Health articles, Health tips and tagged abdominal pain, anxiety, bloating, depression, female fertility, female infertility, fibroids, hormonal imbalance, infection, inflammation, tumor.